Once again, one more hot and tangy side dish! This is an another South Indian side dish which is liked by every one. This dish is prepared in all Southern states of India. Flavour and ingredients very from one state to another. Obviously, I am going to tell you Karnataka (India) style of preparing red chilly chutney. This dish is prepared from red tomatoes, red chillies along with some spices and lentils. I am preparing this dish without using onion and garlic. If you want, you can use onion and garlic instead of hing. I tried to make it easy for you. This dish can be served with roti, chapati, paratha, khichadi (Pongal), upma and all most all main course. You can also use it as bread spread and inside spread for masala dosa. 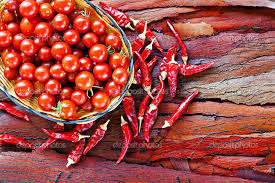 Let’s see the preparation of hot and tangy red chilli with red tomato chutney. Wash tomatoes with plane water, cut them into 4 pieces. Wash and clean coriander leaves and curry leaves, cut red chilli into two pieces and keep them separately. Place a Kadhai (frying pan) on medium flame. pour oil in it. Add mustard seeds, wait until they splutter completely. Add chana dal, udad dal, jeera and red chillies to it. You have to add them one after the other and stir them continuously while adding them. Roast them for 1-2 minutes or until they turn into golden brown colour. Add curry leaves, chopped coriander leaves, hing, haldi, chopped tomato and tamarind pulp, one after the other, to it and stir them for 10 to 15 seconds. Cook it for 5 minutes closing the pan with lid on medium flame. Open the lid and mix the content with spoon, cook it further for 1-2 minutes. Allow it to cool down, it may take 5-10 minutes. Pour the cooked stuff to a medium size mixer jar, add salt and a little quantity of water to it and grind it coarsely or if you want fine paste, you can grind it to a fine paste as well. Take it out to a bowl. Hot and tangy red chilly tomato chutney is ready to serve. Isn’t it easy!